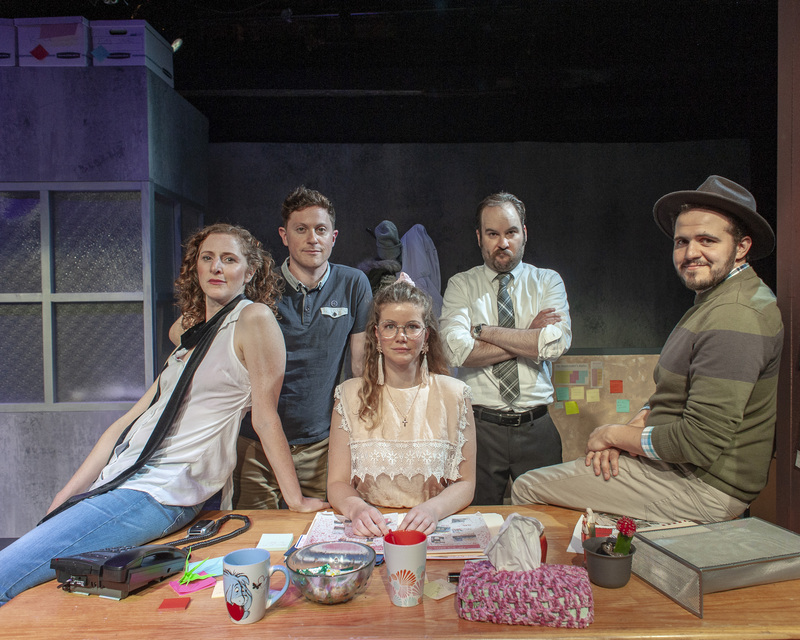 The cast of “Washed Up on the Potomac” (L-R: Jessica Bates, Max Forman-Mullin, Melissa Quine, Cole Alexander Smith, Vincent Randazzo). Photo Credit: Ken Levin. Three hapless proofreaders, their harried boss, and a mysterious character named “that guy” who does little else but toss paper airplanes from behind a glass partition, work in the dismal basement of a Washington D.C. advertising agency. Stuck in a dead end situation, with failing power (the lights are constantly flickering), they appear to be, truly, “washed up.” On this day, they hear about a body that has literally washed up that very morning on the shore of the Potomac. Could it be the body of a missing colleague who disappeared a year ago? The drab, put upon Sherri (an excellent performance by Melissa Quine) thinks not. Sherri likes to imagine that the missing colleague dissappeared into a happier, more exciting life, and dreams of doing the same. But it really does seem that our proofreaders (Sherri, plus wannabe novelist Mark and wannabe rock star Kate) have proved nothing in their lives; the proof of their pudding is missing in action. Mark is unpublished and Kate is nearly 40 years old, still riding on the fumes of a songwriting contest she won as a teenager. These sad people are living cliches and their predicament predictable. But, Rosen’s gift for dialogue, excellent production values from the design team, skillful direction by José Zayas, and outstanding work from the five actors lifts the pedestrian premise to something very special. As presented here, it is impossible not to become involved with these characters. Jessica Bates as Kate the rocker is particularly good, capturing Kate’s talent and despair and the gentle romance between her and the poignantly boobish Mark (Vincent Randazzo) is lovely. Lynn Rosen understands the high emotional stakes at play in these seemingly unimportant lives and makes us care. “Washed Up on the Potomac” plays on the stage of the Custom Made Theatre (not at the usual SF Playhouse) through Sepember 1, 2018. For further information, click here. 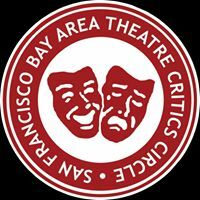 “Washed up on the Potomac” by Lynn Rosen, a world premiere presented by SF Playhouse. Director: José Zayas. Scenic Designer: Heather Kenyon. Costume Designer: Madeline Berger. Sound Designer: Sarah Witsch. Sound Designer: Sophia Craven. Properties Designer: Bethany Wu. Projections Designer: Angela Knutson. Sherri: Melissa Quine. Giorgio: Cole Alexander Smith. That Guy: Max Forman-Mullin. Kate: Jessica Bates. Mark: Vincent Randazzo. Posted in Reviews.Tagged Charles Kruger, Lynn Rosen, SF Playhouse, theatrestorm, Washed Up on the Potomac.